Start the Summer off with a Sale! One thing we pride ourselves on is our selection of fresh flowers around the shop throughout the year. Jonathan and Stiles both excel at arranging flowers, and can both do it with virtually no effort! For this arrangement, in an old salesman’s sample, Jonathan went out and picked some pink and white azaleas and stuck them into the trough. They won’t last long, because there’s no water, but for the few hours, they looked terrific. Here’s another little arrangement a friend whipped up, using azaleas and lilacs she picked at the shop… with our permission, of course. She used a small double-handled bowl for the arrangement. Here are some of our other arrangements through the years. Be sure to check out the flowers at Halcyon House Antiques! We all worry about the children these days who have their noses stuck into their electronic devices playing games. But we remember those long summer days around the pool or at camp when we played games like dominos, cards or board games. And of course, there were the “bad boys” down the street who taught us all to play poker, a skill that served us well in college! At Halcyon, we have a selection of these games that are just gorgeous! Let the games begin! As always, if you see anything that catches your fancy, please call our fancy-man, Eric. We were playing around with some table-settings the other day, pulling china pieces out and replacing them with others. Moving napkins, changing silverware and glasses. All for our fun and your entertainment. We started with the fish course, with two of our fun fish dishes. Here, we went for slightly fewer than 50 shades of blue, with some classical patterns and some whimsical ones, too. Now we are starting to layer the plates, with three complimentary dishes. Although we’re mixing a lot of patterns, they all work together because they’re all a similar scale and aesthetic, and they’re all shades of blues. As always, if you’re interested in anything you see here, please contact Eric. 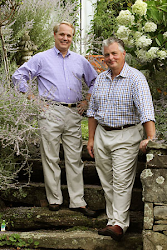 In 2008, Stiles T. Colwill and Jonathan Gargiulo opened Halcyon House Antiques. The idea was to create a retail space mixing antiques, fine art, one-of-a-kind furniture and decorative accessories in actual room settings. Using Stiles' decorating talent and Jonathan's buying and merchandizing skills, Halcyon House Antiques has quickly become an extension of their lifestyle – casual living comfort, a love of entertaining and a celebration of friends. Don't forget that you can pin any of our images to your page. Just roll over the top left corner of any image and the Pin It logo will pop up. Click and Pin!